Take one of those gorgeous hanks of hand-dyed sock wool from your stash and put it to good use! As you make a pair of the EasyFit Lite Gloves, you’ll be guided through customization for different finger lengths and special joins to minimize gaps. There’s even a bonus with this pattern. 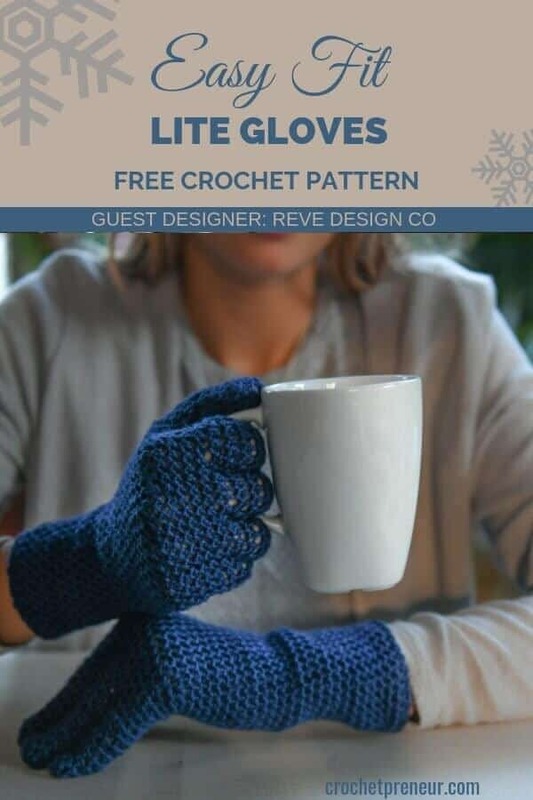 When you purchase the premium downloadable version, you will also have instructions to adjust the pattern to complete these as Fingerless Mitts. It’s an Intermediate level pattern, due to the fiddly joins. Special Join (proprietary) To join the two sides of the glove to form the holes for the various fingers, without a gaping hole (see photos in “Thumb” section), you’ll need to insert the hook into the Back Loop Only of the current stitch AND the stitch indicated on the opposite side. Draw the yarn through both the loops and continue with the stitch as normal. The next stitch will be tricky, as it will include the back loop from the special join, as well as the front loop of the same stitch from the previous row. This is important, as it reduces holes between the sections. RND 26 : Cshdc. Hdc in next 4 st. Hdc2tog over next 2 st. Hdc in next 4 st. Hdc2tog over next 2 st. Join to top of Cshdc to join. Break Yarn and pull yarn through stitch – leaving enough tail for sewing up (around 10cm/4”). NOTE: Continue repeating Round 21 until your gloves reach the base of your fingers, covering the webbing – I worked until 31 rounds, but a tester worked until 27. Place 3 stitch markers at equal spaces to mark the finger joins – try on and join the two halves at the finger joins. Adjust the numbers for the finger instructions, according to what is comfortable to you – eg. you may want 5 stitches on each side for the middle finger and only 4 stitches for the forefinger. RND 9: Cshdc. Hdc in next 4 st. Hdc2tog over next 2 st. Hdc in next 4 st. Hdc2tog over next 2 st. Join to top of Cshdc to join. Break Yarn and pull yarn through stitch – leaving enough tail for sewing up (around 10cm/4”). Repeat the same process as for the forefinger. RND 6: Cshdc. *Hdc2tog over next 2 st.** Repeat * to ** 2 more times. Hdc2tog over next st using slst into the Top of the Cshdc to join. Break Yarn and pull yarn through stitch – leaving enough tail for sewing up (around 10cm/4”).
. 2. Pull the yarn tight, so that your finger tip is closed. 3. Backstitch the tail in place. 4. Transfer your tail through the centre of the tip, to the inside of the glove finger. 5. Turn each glove inside out, weave in all ends and you’re done! 6. Enjoy your EasyFit Lite Gloves. I know you’re going to love making the Easy Fit Lite Gloves and I so look forward to seeing your finished product.